Good job for saving money by doing a little manual labor! 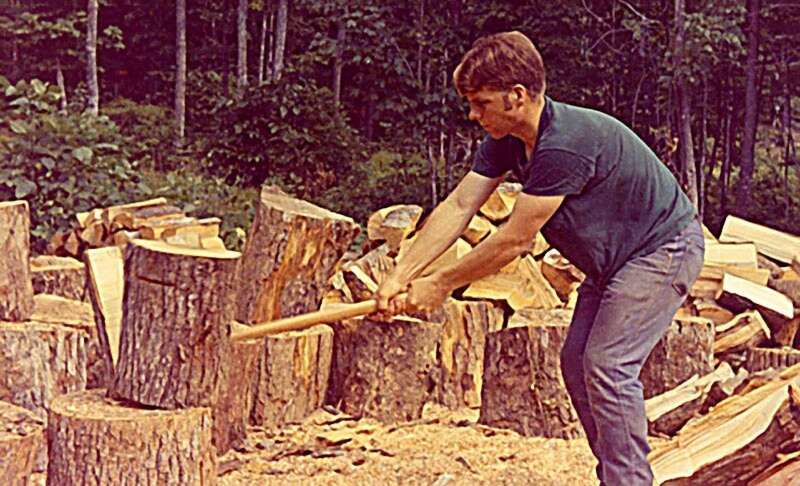 Here's a beginners guide on how to split firewood! You'll start by cutting a tree down using a chainsaw. Cut closer to the bottom of the tree. To make sure it falls in the right direction, cut a triangle shape out of the same direction you want it to fall. Don't over estimate the length of your stove! If the pieces are to long, you will need to make a second cut and you will have tiny pieces of wood leftover that are obnoxious to stack. Time to start the tough part. The first part is to set the wood up so its standing up tall. Hold your axe/maul/sledge axe with your dominant hand towards the head of the axe and your other hand near the bottom. Bring the axe head up a little past your head. When you swing down, take a step with the foot opposite your dominant hand while sliding your dominant hand towards the bottom. (This gives you more momentum) ALWAYS FOLLOW THROUGH! If the piece is to difficult to split because of a knot or because the wood is just dense, use a wedge. A wedge is a triangular piece of durable metal you hit with a sledgehammer for and easier split. All you do is set up the wedge and tap it in place with a sledge hammer or the flat side of your maul. Then you beat it as hard as you can straight down.